Can you see the difference from last week? After yesterday's list of tragic events that took place during a horrific week, last week, there are also reasons 2B cheerful and here they are. The linky is back with Michelle on Mummy from the Heart for the month of November. The person in the School Greenhouse who gave me the plants last week, also told me how to take cuttings. "It's easy," she said. I've tried it before and it never worked. 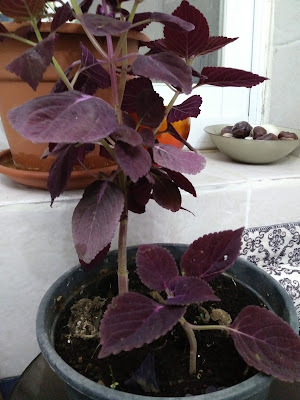 One of the small branches of the pretty purple plant got a bit crushed and droopy on the way home. So I took it off and planted it in the soil next to the mother plant. You can see it looking all sorry for itself here. Well, blow me, if it hasn't taken. I have a little purple plant making its own way into the world, independent of its mother. I'm so proud. This week I'm going to set it up in its own home nearby, but no so close as to be under each other's feet. "The shootings at Tree of Life were just horrendous - a woman originally from Toronto was one of the victims - members of many churches and mosques here are forming circles around various synagogues this weekend as a sign of solidarity and safety. " I was very touched and moved by this news of love and support from the wider community. For the first time ever, they coordinated all the municipal elections onto one day and declared it a national holiday. We also have a holiday for the government elections but this is [supposedly] only once in four years. Apart from that, the only other national holiday day like election day is Independence Day in May. I'll explain. Most adults work a normal, Western World five day week from Sunday till Thursday. However, most children are in school on Friday mornings. Teachers get a different day off in lieu of Friday mornings but the children don't (although they do finish early on Tuesday afternoons when the parents don't). Thus, you have to be at home on Fridays for school. You have to get up early and hussle your kids off to school. And when they come home around midday, the shops and eateries are only open for another two hours until 2pm (sometimes 3pm in the summer). Hardly a family day. Shabbat comes in at sundown on Friday night and lasts for 25 hours, starting with a festive family meal. There are some places of entertainment (a few restaurants and some cinemas in Jerusalem) and shopping malls open (not in Jerusalem) for those who want them. But for those keeping a traditional shabbat, they are up early for synagogue on Saturday, they have a festive family lunch, and they do not use mechanical transport, screens, telephones, or anything electrical throughout the day. About those festive family meals... they don't appear out of nowhere. They have to be prepared and cooked on Friday, the house is cleaned, and many families host overnight guests for the duration because they can't travel home after dinner. I'm not complaining about Shabbat, it's a lovely, sociable day. However, it has its limitations as you can see. That is why a national holiday is so amazing. We have no [we call it] Sunday here. For religious Christians outside Israel it would be your Saturday (although your Sunday isn't nearly as restrictive as Shabbat). A day to go on long trips, eat out, for family shopping, a day at the beach, parties, etc... One morning in the week to get up late and have pancakes or French toast for breakfast and then maybe travel to your grandparents or cousins for tea. There have been many attempts here to give us our Sundays, especially as no business can be done with the outside world on that day. Sadly, it's not happening. For one thing, we'd effectively be working on a 4.5 day week as you'd still need to finish early on Fridays. Otoh, shopkeepers and eateries take over a month's worth of income on election days. Finally, a great reason 2B cheerful, we have two new female mayors. One in Haifa, Israel's third largest city, and one in Bet Shemesh where the ultra-orthodox have tried to intimidate women out of public life completely (e.g. even blurring their faces out of photos and tearing down adverts with pictures of women). Two excellent results.